Alexander Stewart, 1st Earl of Buchan, but more commonly known as the Wolf of Badenoch, lived from 1343 to 24 July 1394. He was the fourth illegitimate son of the future King Robert II of Scotland and of Elizabeth Mure of Rowallan, but became legitimated in 1349 upon his parents' marriage: he was also the younger brother of the future Robert III. The wider picture in Scotland at the time is set out in our Historical Timeline. Scottish history has its fair share of deeply unpleasant characters, but Alexander Stewart, 1st Earl of Buchan is a strong contender for the title of least pleasant of the lot, another contender being his brother Robert Stewart, 1st Duke of Albany. But for very different reasons: while Robert Stewart managed to gain a grip on ultimate power in Scotland by devious or violent means during the reign of three different Scottish kings, Alexander Stewart simply abused his power on a systematic but more regional scale, maintaining a rule of terror across much of the Highlands by imprisoning and murdering those who offended him and pillaging the countryside. His behaviour led to him being censured by the King's Council in 1388, and to his being known to history as the Wolf of Badenoch, though he has also been called the Celtic Atilla. Alexander was made Lord of Badenoch and granted large estates in the Highlands by his father Robert II on 30 March 1371. In 1382 he was made 1st Earl of Buchan (there had been earlier Earls of Buchan, but he was the 1st Earl of the title's second creation), and he also served as Justiciar, or the Crown's Chief Law Officer, in northern Scotland: in effect he exercised the full authority of the Scottish Crown throughout the Highlands. The Wolf of Badenoch had a number of lairs. The most notable was Lochindorb Castle on an island in Lochindorb, north of Grantown-on-Spey, but he was also associated with Drumin Castle near Glenlivet, Castle Garth near Glen Lyon, and Ruthven Castle near Kingussie, a site occupied since the early 1700s by Ruthven Barracks. Alexander added considerably to his landholdings by marrying Eupheme de Ross, Countess of Ross in July 1382. They had no children: a fact that Alexander blamed on his wife (and, to be fair, as he was by then well on his way to fathering his total of around 40 illegitimate children by a large number of different women, he was probably right). In 1389 Alexander sought the intervention of the Bishop of Moray, Bishop Alexander Bur, to bring his marriage to an end. The Bishop came down on the side of Eupheme, and when Alexander then expelled her to make way for his mistress of the moment, Mariota Athyn, he was excommunicated by the Bishop of Moray. It was Alexander's response to his excommunication that resulted in his label as the Wolf of Badenoch. First, the monk who came to Lochindorb castle with the news of Alexander's excommunication was consigned to the castle's bottle pit. Many Scottish castles had these deeply unpleasant dungeons accessible only by a trap door in the roof. Not many could also boast three feet of water covering the floor because of their island location. Then, in May 1390, Alexander descended on Moray at the head of a large number of "wild, wykked Hieland-men." Alexander sacked the town of Forres, before heading east, destroying Pluscarden Abbey en route to Elgin where he arrived in 17 June 1390. 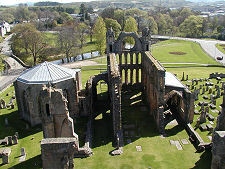 Here he burned much of the town and destroyed Elgin Cathedral, the second largest cathedral in Scotland, widely known as the Lantern of the North. Alexander's older brother, Robert III, who had only just succeeded to the throne and had yet to be crowned, called upon him to do penance for his crimes and pay significant reparations: then pardoned him. Whether the Wolf of Badenoch's attack on Moray had simply been a case of getting even with the Bishop: or whether it was in reality intended to be the start of a power play for Scotland more widely, immediately after the death of his father Robert II, is a matter of debate among historians. No-one for a moment, however, believes that he was truly repentant afterwards. 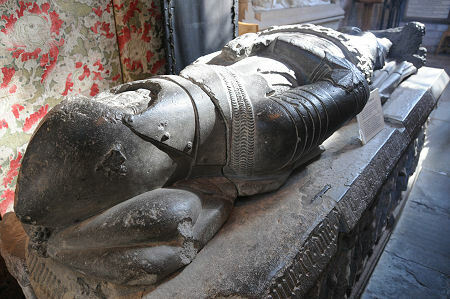 Alexander Stewart died in 1394 and he was then buried in Dunkeld Cathedral. His tomb, topped by an effigy in armour, is one of the few Scottish royal monuments to have survived from the Middle Ages. The details of the death of the Wolf of Badenoch are unclear. Perhaps it is best to stick with the popular legend: that on 24 July 1394 a visitor dressed all in black arrived at Ruthven Castle and challenged the Wolf of Badenoch to a game of chess. That night the castle was beset by a terrible storm of thunder and lightning. The following morning there was no sign of the visitor, but the castle servants were discovered outside the castle walls, apparently killed by lightning. The Wolf of Badenoch himself was found in the banqueting hall: his body unmarked, though the nails in his boots had been torn out. Such, it would seem, are the perils of playing chess with the Devil. The Face of the Wolf?